Our Lady of Peace, patroness of the fishermen, welcomes dozens of boats on January 24th during the traditional Maritime Pilgrimage with the Peace Torch to give thanks and plead for a prosperous year. Bucerías will celebrate the traditional Our Lady of Peace Patron Saint Festival from January 16th through the 24th of the month. This is a religious celebration that has been observed for many years in the Riviera Nayarit. The most symbolic act of the tradition is the Maritime Pilgrimage with the Peace Torch, which is escorted by boats that place themselves in the shape of a cross on January 24th. 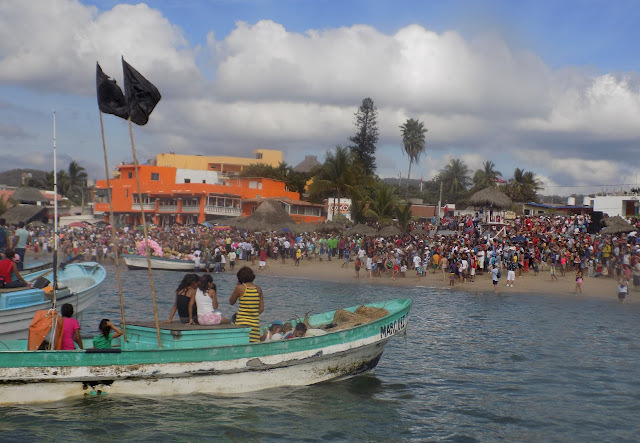 The fishermen leave from La Cruz de Huanacaxtle and once they arrive in Bucerías attend a Mass offered for the Virgin in the Church of Our Lady of Peace. Men from all over the southern coast of Nayarit come together to pray for a year of good fishing, tourism, health and prosperity for the area’s families. During the week there are masses held for the faithful, vibrant fireworks displays and, of course, the crowning of a new Queen of the Patron Saint Festival. All of these activities take place in the main plaza in Bucerías. Another aspect of the festivities is the sports, artistic and cultural events, which are an important part of the community development of the Riviera Nayarit. The Our Lady of Peace Patron Saint Festival not only welcomes the residents of Bucerías, but also those of nearby towns and is a favorite of the many Canadian expats that live in the Wind Capital of the Riviera Nayarit, as well as visitors from the US and other Mexican nationals. The bazaar, the dances, the festivities and the general rejoicing that takes over Bucerías is one more reason for the increase in tourism and income from sales, which together represents a strong revenue for the locals who welcome visitors with open arms.